Sustainable people/places/things worthy of celebration. In the infancy of Amborella Organics, when recipes were being developed and seed-bearing sticks were growing all around us, we were simultaneously redefining how we wanted to consume food for the rest of our lives. Not today, not for 30 days, but removing food and adding nutrients that could be a lasting commitment to self. This included, and to our best ability still includes, being gluten/dairy/soy-free. There was an immediate adjustment that came with our morning cup of coffee. Almond milk lacked froth and most coffee shops only offered soy as a non-dairy alternative. A minor issue for some, but morning coffee to us was a ritual. 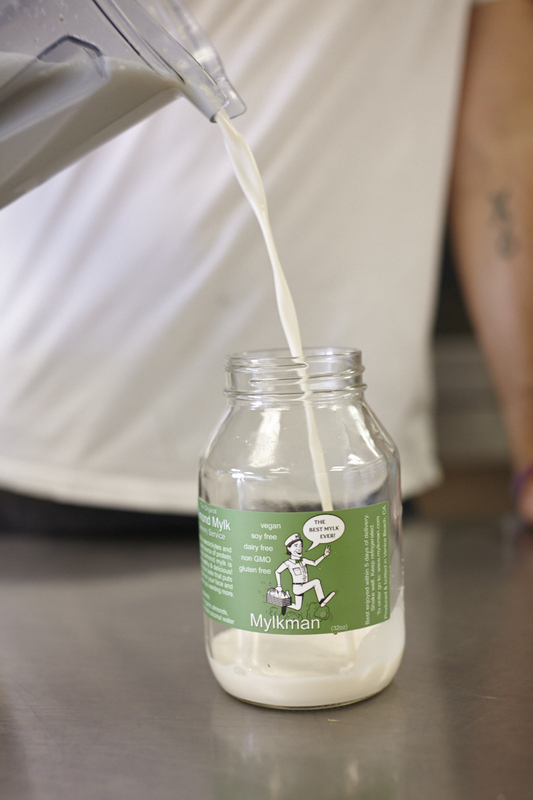 We attended Coffee Con in Los Angeles and that’s where we met Mylkman, a local almond "mylk" company that’s zero-waste and baby does it froth. You won’t find them in Whole Foods, as in order to make this possible they’d have to compromise the purity of their ingredients. We uphold the uncompromising values of Mylkman Delivery Service and it’s with great honor that we present an interview with founder and CEO, Jeff Leaf below. JL: We launched in 2011. AO: Why did you start Mylkman? buy it. Then one after the other, word spread. and Mylkman was born. AO: When did you begin to offer coconut water? 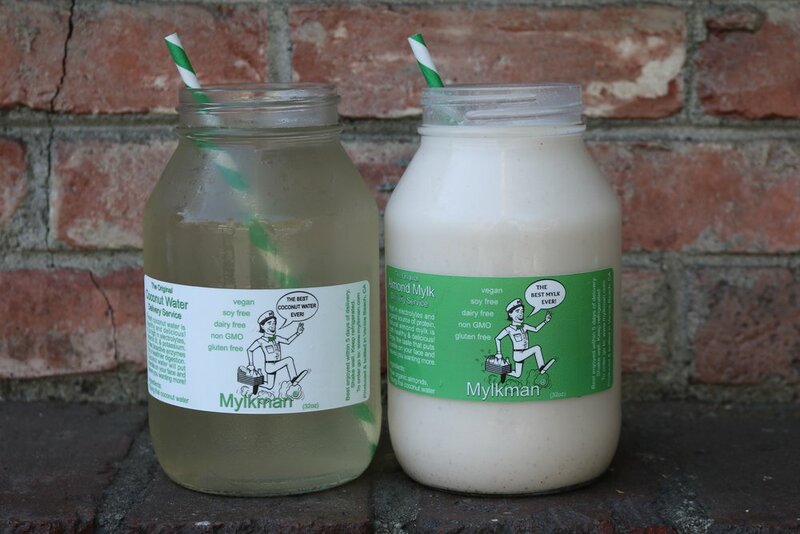 Do you offer coconut mylk? JL: I can’t remember exactly, but it was about 4 years ago. We don’t offer coconut mylk, but offer coconut water. AO: Why do you spell it mylk instead of milk? JL: Well milk is considered “dairy”, so we changed it up. AO: How would you describe the taste to our readers who haven't sampled? JL: It’s like liquid ice cream!! The best ever! AO: One of your colleagues, who I connected with at Coffee Con told me there is little waste from the coconut after you're done. All of your coconut meat is sold to local cafes, who in turn use this for coconut puddings, smoothies etc. JL: We’re almost 100% zero waste, as a company. AO: Where do you source ingredients from? JL: Our almonds are from Italy and coconuts from Thailand. AO: Where do you deliver? JL: We deliver to all of LA county. AO: Do you plan to expand delivery and manufacturing or are you interested in small batch? JL: Yes, we will be expanding all across the USA. We have had a huge demand. AO: Where will you expand first? Do you have a timeline? JL: Most likely NYC in 2018. AO: Would you change the recipe to get a longer shelf life and be sold in somewhere like Whole Foods, or are you happy with what you're doing? JL: We are happy with what we are doing, and don't want to compromise the product by extending shelf life. Our clients value how fresh it is. AO: What is your shelf life, what ingredients are you avoiding to extend this shelf life, and why? JL: 3 to 5 days. We don’t put any additives in because we don’t want to compromise the product. AO: How do you live a sustainable life? JL: I try my best to recycle, reuse, shop at second hand stores and only purchase products for my house that are vegan. AO: How do you consume coconut milk and coconut water? AO: Your almond milk is enticing for coffee shops because if DOES in fact froth unlike most non-dairy alternatives. JL: Yes, so sweet and yummy. AO: Do you have a relationships with nature? JL: Well, I grew up in Montana where I was very close to the outdoors. I now live in New York City most of the year, so I’m trying to find that balance everyday. AO: Do you plan to release additional products?